TSUNEISHI SHIPBUILDING Co., Ltd. (HQ: 1083 Tsuneishi, Numakuma-cho, Fukuyama, Hiroshima, Japan; President: Kenji Kawano) launched its first completed 77,000 DWT (LRI) (*1) Product Tanker at its Group company, TSUNEISHI GROUP (ZHOUSHAN) SHIPBUILDING, Inc.(Location: Xiushan Island, Daishan County, Zhoushan City, Zhejiang Province, P. R. of China; President: Jiro Sato; hereinafter, TZS) on August 10, 2018. The 77,000 DWT (LRI) Product Tanker has a larger cargo tank than other standard LRI tankers, which improves transport efficiency. 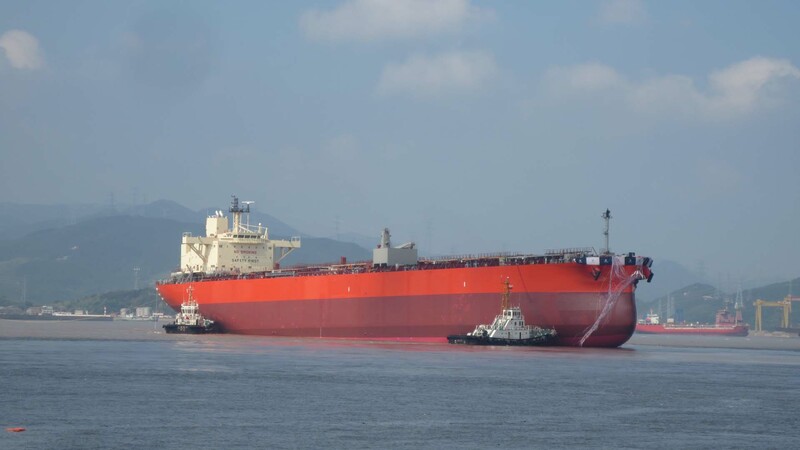 It also has a wider hull, thereby achieving the same level of draft and air draft as MR tankers (50,000 DWT) and enabling this tanker to enter ports that have restrictive draft limitations. The new LRI Product Tanker is equipped with our company’s unique energy-saving technologies MT-FAST (*2) and TOP-GR (*3), and the hull and accommodation have been designed to reduce resistance and thereby improve propulsion efficiency. These efforts have enabled this tanker to achieve high energy-saving performance in addition to high fuel efficiency, thus realizing an improved level of environmental and economic performance. TSUNEISHI SHIPBUILDING continues to develop a lineup of ships that extend beyond our mainstay of bulk carriers, as well as a diverse range of other ships, such as tankers and container carriers, in order to meet the various needs of the world’s maritime market. The new 77,000 DWT Product Tanker is being rolled out along with the existing Aframax Crude Oil Tanker to fulfill the changing needs of the market. *1. LRI: LRI stands for Large Range I, and refers to tankers weighing 55,000 – 80,000 tons. *2. MT-FAST: An energy-saving hull fitting that can boost propulsion efficiency by approximately 4% by attaching multiple fins to the front of the propeller to adjust water flow. This was developed in partnership with Monohakobi Technology Institute (MTI), a NYK Line Group company. *3. TOP-GR：We designed and developed a highly efficient, low-vibration energy-saving propeller with an optimized blade number, diameter, aerofoil shape, and blade geometric distribution through precise computer-based calculations and simulations. Shipbuilder: TSUNEISHI GROUP (ZHOUSHAN) SHIPBUILDING, Inc.